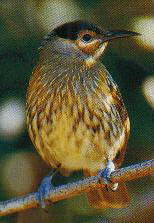 Macleay’s Honeyeater is endemic to the Wet Tropics region. It is common in rainforests at all altitudes. It can be seen about the rainforest and its edges, and at times, in orchards and gardens. It is harder to see than most other honeyeaters as it is unobtrusive, and it remains higher than many of the other honeyeaters in the rainforest. Its main call is a musical to wit, too wee twit song. It searches amongst epiphytic growths and vines as well as gleaning from leaves. Its diet consists of roughly 70 percent insects and spiders, 20 percent nectar, and 10 percent fruit. Because of its feeding habits, it plays an important role in the pollination of rainforest flowers. The breeding season is from September to March. Easily viewed at Chambers Wildlife Rainforest Lodge . The Macleay's Honeyeater, is a medium sized honeyeater with a distinctive 'tartan' pattern, black cap and orange patch around the eye. It has also a distinctive, fast and cheery 'tosweet-swe-twseet' call that is heard around the lodge.